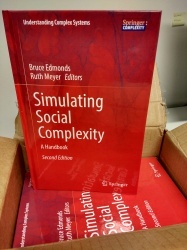 The second edition of the handbook Simulating Social Complexity, edited by Bruce Edmonds and Ruth Meyer, has now been published by Springer and is available as a hardcover or eBook. This volume examines all aspects of using agent or individual-based simulation to investigate social systems. Social systems include all those systems where the components have individual agency but also interact with each other. This includes human societies, all kinds of groups, and increasingly socio-technical systems where the internet-based devices form the substrate for interaction. These systems are central to our lives, but are among the most complex known. The complexity often makes analytic approaches infeasible but, on the other hand, natural language approaches are also inadequate for relating intricate cause and effect. This is why individual and agent-based computational approaches hold out the possibility of new and deeper understanding of such systems. This second edition adds new chapters on different modelling purposes and applying software engineering methods to simulation development. Revised existing content will keep the book up-to-date with recent developments. This volume will help those new to the field avoid “reinventing the wheel” each time, and give them a solid and wide grounding in the essential issues. It will also help those already in the field by providing accessible overviews of current thought. The material is divided into four sections: Introduction, Methodology, Mechanisms, and Applications.